In June 2014 HOPS — Healthy Options Project Skopje and Coalition “Sexual and Health Rights of Marginalized Communities” published the second issue of the magazine DRUGS – POLICIES AND PRACTICES. The main topic of the issue No. 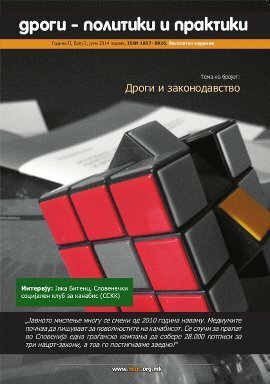 2, “Drugs and Law”, relates to the drug policies in Macedonia and in the other countries in the world. The authors in this issue, in a popular manner, aspire to recapture different levels and experiences in policies and practices of the regulations of drugs and drug use in Macedonia and in the world. Next Article Everything Under Control?? ?